It has been a long time since I've posted a Beer of the night review, tonight is the first one in weeks. Tonight's review is by Spymac member Subtrut, enjoy! Well I found myself in the liquor store today, lightly browsing but as usual slowly drifting towards my brand of choice when I was stopped in my tracks. I had heard of this beer, but never thought, I'd actually find it. My excitement was obvious as I bounded over to the shelf and scooped up the six pack. N'yuk n'yuk. 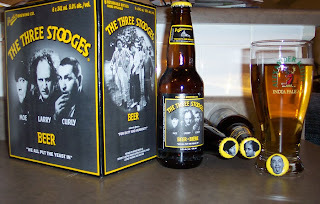 My friends, I am talking about 'Three Stooges Beer.' Yes there is a beer paying homage to the famous trio of knuckeheads, Moe Howard, Larry Fine, and Curly Howard. being a stooge fan, I'd heard about the beer a few years ago, but never thought I'd actually get to tip a few back. But let's get to what everybody came here for the beer. My very first impression was good, upon twisting the cap I was greeted with a sharp crisp psst and that oh so pleasant beer smell. However when I poured the beer into a glass it seemed to loose it's head and carbonation very quickly. Wiseguy eh? As you can see in the pictures there isn't much head on the glass I poured, there was less that 30 seconds to a minute between pouring and taking the picture. But it looked good, it was very pale (I like the pale ales) and had a nice colour to it. Nothing floating it it either, which is a good sign in my books. Now for the ultimate test. The taste test. I took a swig, and was a bit disappointed. 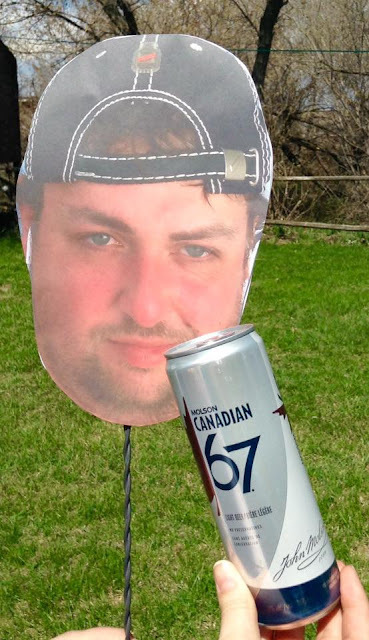 The beer tasted flat, and a little flavourless. Mind you it didn't have a bad flavour, just not a great flavour. It did oddly enough, leave me with an aftertaste that seemed quite a bit stronger than the actual taste. But after putting a few back I really didn't care much about taste, or lack thereof. The beer is brewed by Lakeport Brewing Corporation, out of Hamilton Ontario. 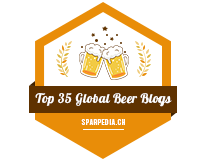 I couldn't find much information on the web, except that Lakeport tends to brew beer for the lower end 'cheap beer' market. That might explain the quality, however it was not cheap. Here in Edmonton, I payed $9.95 CAD for a six pack which is on par with most imported and microbrewed beers. The store I was at didn't have cases, so I'm not sure if they're available, or what the price may be. Other than price (which I can get by for beer) there is nothing offensive about Three Stooges Beer. A must for stooges fans and collectors, The Three Stooges Beer doesn't offer an outstanding reason for anyone else to buy this beer. So my final rating is a 3 out of 5. As cheap beers go this is average. I just wish it was cheap. P.S. It does mix pretty well with whisky.